Born: July 25, 1828 in Sandwich Ma. 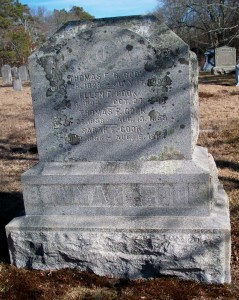 Died: July 17, 1904 in Pocasset Ma. at 76 yrs, 11 mos, 24 d.
1. Ella M. Cook Rogers; (August 9, 1851 – September 30, 1873); Married Orin Austin Rogers (1847 – 1926) (Alonzo Rogers & Lydia C. (–)) in Boston Ma. on June 22, 1873; Ella died in Boston Ma. at 22 yrs, 1 mo, 21 d; Orin married (2) Elizabeth/Lizzie L. Curtis (William Curtis & Tamara (–)) in Boston Ma. on July 9, 1878. 2. Annie Augusta Cook Bowman Giles; (December 18, 1853 – April 3, 1925); Married (1) Charles M. Bowman (1847 – 1898) (Lucius Bowman & Eliza P. (–)) in Boston Ma. on January 1, 1877 & married (2) John Francis/Frank Giles, Civil War (1840 – ?) (John C. Giles & Mary B. Butterfield) in Boston Ma. on September 6, 1904; John married (1) Lucy Ann Emerson (1842 – ?) (Gorham Emerson & Sarah C. (–)) in Ashland Ma. on March 30, 1864; John & Lucy divorced; Annie & Charles are buried in Pocasset Cemetery. 3. Thomas F. Cook; (July 21, 1859 – August 7, 1859); Thomas died at 17 d.; He is buried in Pocasset Cemetery. 4. William F. Cook; (August 27, 1860 – ? ); No further information. 5. Sarah E. Cook; (February 2, 1866 – August 18, 1867); Sarah was born & died in New Bedford Ma. at 1 yr, 6 mos. ; She is buried in Pocasset Cemetery.